Drain the juice out of the canned pineapple into a measuring cup. You'll want 1/4 cup of the juice. Add a little water if it isn't quite 1/4 cup. Preheat oven to 350 degrees F. Prepare a 9 x 2-inch round baking pan by spraying generously with cooking spray. In a large bowl, lightly beat the egg. Add the orange juice, pineapple juice (from the can), sugar, oil and orange zest. Mix well. In a separate bowl, sift together the flour, baking soda, cinnamon and salt. Add the dry ingredients to the wet ingredients and mix until just combined and moistened. Stir in the shredded carrot and crushed pineapple. Transfer batter to prepared pan. Bake for 25 to 35 minutes at 350 degrees. Test coffee cake with a toothpick at the 25 minute mark. If a toothpick inserted in the center comes out with uncooked batter on it, the coffee cake needs to cook longer. 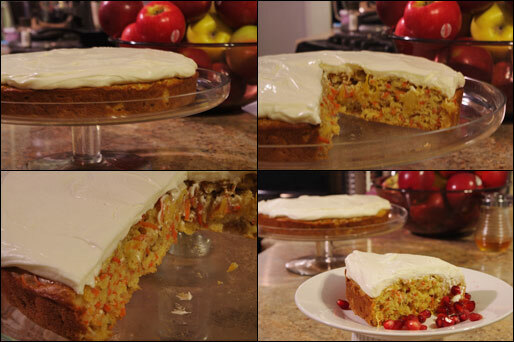 When cool, top with optional cream cheese frosting (recipe below). In a metal bowl, beat the butter and cream cheese with an electric mixer until combined and fluffy. Continuing to beat, slowly add the powdered sugar. Beat the vanilla in at the very end when everything has a smooth frosting-like consistency. Carrot cake for breakfast! This coffee cake recipe also includes directions for an optional cream cheese frosting. If desired, you could include raisins in the batter. Just toss a handful in when you fold in the shredded carrot. Recipe number 3068. Submitted 11/16/2011.